The local boat, the Hectoria has two cruises each day, leaving from Badentarbet pier. 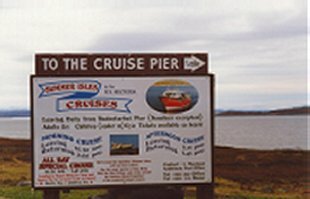 This takes you out to the Summer Isles where you will see a variety of birdlife and seal colony and perhaps some porpoises, dolphins or whales. You get to land on one of the islands, Tanera Beag, for about an hour - a good chance to wonder around and check the beaches, or have your picnic. On the way back to the pier, you will head into the bay at Tanera Mor, the only inhabited island. An excellent trip and one which gets good reviews from all who sail on her! Find out more about Tanera, one of the islands you will visit on your trip.